ESSENTIAL SHOE FOR YOUR CLOSET: Stay comfortable and on-trend with this Fall/Winter staple, which is available in versatile neutrals and shiny metallics to pair perfectly with your everyday outfits, whether you're keeping it casual or dressing up! 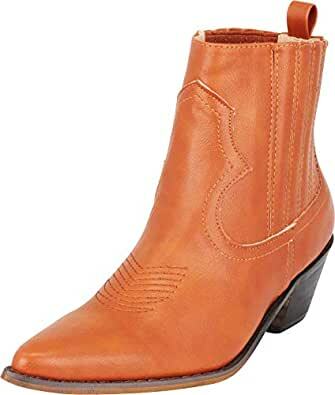 This cowboy ankle boot from Cambridge Select features a closed, pointy toe, Western-inspired stitching, side stretch elastic gussets for pull-on functionality, and chunky, block heel for all-day walkable comfort. Imported.